Habanero Alcohol-FREE Liquid Extract, Organic Habanero (Capsicum chinense) Dried Rinds and Fruit Glycerite Features and description: ALCOHOL FREE! NON GMO! GLUTEN FREE! Expertly extracted Habanero ALCOHOL-FREE liquid extract! 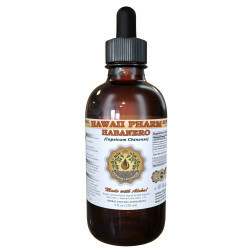 Habanero Glycerite co..
Habanero Liquid Extract, Organic Habanero (Capsicum chinense) Dried Rinds and Fruits Tincture Features and description: NON GMO! Gluten Free! Highest Strength Habanero liquid extract! Habanero liquid extract contains ONLY natural ingredients! High..
Hai Feng Teng Alcohol-FREE Liquid Extract, Hai Feng Teng, Kadsura (Piper Kadsura) Stem Glycerite Features and description: ALCOHOL FREE! NON GMO! GLUTEN FREE! Expertly extracted Hai Feng Teng ALCOHOL-FREE liquid extract! Hai Feng Teng Glycerite c..
Hai Feng Teng Liquid Extract, Hai Feng Teng, 海风藤, Kadsura (Piper Kadsura) Stem Tincture Features and description: NON GMO! Gluten Free! Highest Strength Hai Feng Teng liquid extract! Hai Feng Teng liquid extract contains ONLY natural ingredients! ..
Han Fang Ji Liquid Extract, Dried root (Stephania Tetrandra) Alcohol-Free Glycerite Features and description: NON GMO! Gluten Free! We made this Han Fang Ji liquid extract using ONLY natural ingredients! This extract does not contain Alcohol, GMO..
Han Fang Ji Liquid Extract, Dried root (Stephania Tetrandra) Tincture Features and description: NON GMO! Gluten Free! We produced this extract using a cold maceration method of extraction to ensure that the broad spectrum of therapeutic plant comp..
Hawthorn Alcohol-FREE Liquid Extract, Hawthorn (Crataegus Laevigata) Dried Leaf and Flower Glycerite Features and description: ALCOHOL FREE! NON GMO! GLUTEN FREE! Expertly extracted Hawthorn Tincture Supplement! Hawthorn Glycerite contains ONLY n..
Hawthorn Alcohol-FREE Liquid Extract, Organic Hawthorn (Crataegus Laevigata) Dried Berry Glycerite Features and description: ALCOHOL FREE! NON GMO! GLUTEN FREE! Expertly extracted Hawthorn ALCOHOL-FREE liquid extract! Hawthorn Glycerite co..
Hawthorn Liquid Extract, Hawthorn (Crataegus Laevigata) Dried Leaf and Flower Tincture Features and description: NON GMO! Gluten Free! Highest Strength Hawthorn Tincture Supplement! Hawthorn liquid extract contains ONLY natural ingredients! High Q..
Hawthorn Liquid Extract, Organic Hawthorn (Crataegus Laevigata) Dried Leaf, Flower and Stem Tincture Features and description: NON GMO! Gluten Free! Highest Strength Hawthorn liquid extract! Hawthorn liquid extract contains ONLY natural ingredient.. He Huan Pi Alcohol-FREE Liquid Extract, He Huan Pi, Albizia (Albizzia Julibrissin) Bark Glycerite Features and description: ALCOHOL FREE! NON GMO! GLUTEN FREE! Expertly extracted He Huan Pi ALCOHOL-FREE liquid extract! He Huan Pi Glycerite contai.. He Huan Pi Liquid Extract, He Huan Pi, 合欢皮, Albizia (Albizzia Julibrissin) Bark Tincture Features and description: NON GMO! Gluten Free! Highest Strength He Huan Pi liquid extract! He Huan Pi liquid extract contains ONLY natural ingredients! High .. He Shou Wu Alcohol-FREE Liquid Extract, He Shou Wu, Fo Ti (Polygonum Multiflorum) Prepared Root Glycerite Features and description: ALCOHOL FREE! NON GMO! GLUTEN FREE! Expertly extracted, Super concentrated He Shou Wu ALCOHOL-FREE liquid extract!.. He Shou Wu Liquid Extract, Dried root (Polygonum Multiforum) Alcohol-Free Glycerite Features and description: NON GMO! Gluten Free! We made this He Shou Wu liquid extract using ONLY natural ingredients! This extract does not contain Alcohol, GMO,.. He Shou Wu Liquid Extract, Dried root (Polygonum Multiforum) Tincture Features and description: NON GMO! Gluten Free! We produced this extract using a cold maceration method of extraction to ensure that the broad spectrum of therapeutic plant comp.. He Shou Wu Liquid Extract, He Shou Wu, 制何首乌, Fo Ti (Polygonum Multiflorum) Prepared Root Tincture Features and description: NON GMO! Gluten Free! Highest Strength, Super concentrated He Shou Wu liquid extract! He Shou Wu tincture contains ONLY nat.. He Ye Alcohol-FREE Liquid Extract, He Ye, Lotus (Nelumbo Nucifera) Leaf Glycerite Features and description: ALCOHOL FREE! NON GMO! GLUTEN FREE! Expertly extracted He Ye ALCOHOL-FREE liquid extract! He Ye Glycerite contains ONLY natural ingredient.. He Ye Liquid Extract, He Ye, 荷叶, Lotus (Nelumbo Nucifera) Leaf Tincture Features and description: NON GMO! Gluten Free! Highest Strength He Ye liquid extract! He Ye liquid extract contains ONLY natural ingredients! High Quality He Ye liquid extrac..
Health Joint, Veterinary Natural Alcohol-FREE Liquid Extract, Pet Herbal Supplement Features: ALCOHOL-FREE! NON GMO! GLUTEN FREE! Hawaii Pharm Health Joint Supplement contains no GMO, gluten, heavy metals, artificial colors, preservatives or synth..
Heart Failure Care Alcohol-FREE Herbal Liquid Extract, Hawthorn Dried Leaf and Flower, Goldenseal Dried Root Glycerite Features and description: ALCOHOL FREE! NON GMO! GLUTEN FREE! Highest Strength Heart failure care NON-Alco..
Heartsease Alcohol-FREE Liquid Extract, Heartsease (Viola tricolor) Dried Leaf and Flower Glycerite Features and description: ALCOHOL FREE! NON GMO! GLUTEN FREE! Expertly extracted Heartsease ALCOHOL-FREE liquid extract! Heartsease Glycerite con..
Heartsease Liquid Extract, Heartsease (Viola tricolor) Dried Leaf and Flower Tincture Features and description: NON GMO! Gluten Free! Highest Strength Heartsease liquid extract! Heartsease liquid extract contains ONLY natural ingredients! High Qu..
Heat Relief, Veterinary Natural Alcohol-FREE Liquid Extract, Pet Herbal Supplement Features: ALCOHOL-FREE! NON GMO! GLUTEN FREE! Hawaii Pharm Heat Relief Supplement contains no GMO, gluten, heavy metals, artificial colors, preservatives or synthet..
Heather Alcohol-FREE Liquid Extract, Organic Heather (Calluna Vulgaris) Dried Leaf and Flower Glycerite Features and description: ALCOHOL FREE! NON GMO! GLUTEN FREE! Expertly extracted Heather ALCOHOL-FREE liquid extract! Heather Glycerite contain..
Heather Liquid Extract, Organic Heather (Calluna Vulgaris) Dried Leaf and Flower Tincture Features and description: NON GMO! Gluten Free! Highest Strength Heather liquid extract! Heather liquid extract contains ONLY natural ingredients! High Quali..
Hedyotis Alcohol-FREE Liquid Extract, Hedyotis (Hedyotis Diffusa) Herb Glycerite Features and description: ALCOHOL FREE! NON GMO! GLUTEN FREE! Expertly extracted Hedyotis ALCOHOL-FREE liquid extract! Hedyotis Glycerite contains ONLY natural ingre..
Hedyotis Liquid Extract, Hedyotis (Hedyotis Diffusa) Herb Tincture Features and description: NON GMO! Gluten Free! Highest Strength Hedyotis liquid extract! Hedyotis liquid extract contains ONLY natural ingredients! High Quality Hedyotis liquid ex..
Helichrysum Alcohol-FREE Liquid Extract, Organic Helichrysum (Helichrysum Arenarium) Dried Flower Glycerite Features and description: ALCOHOL FREE! NON GMO! GLUTEN FREE! Expertly extracted Helichrysum ALCOHOL-FREE liquid extract! Helichrysum Glyce..
Helichrysum Liquid Extract, Organic Helichrysum (Helichrysum Arenarium) Dried Flower Tincture Features and description: NON GMO! Gluten Free! Highest Strength Helichrysum liquid extract! Helichrysum liquid extract contains ONLY natural ingredients..
Hibiscus Alcohol-FREE Liquid Extract, Organic Hibiscus (Hibiscus Sabdariffa) Dried Flower Glycerite Features and description: ALCOHOL FREE! NON GMO! GLUTEN FREE! Expertly extracted Hibiscus ALCOHOL-FREE liquid extract! Hibiscus Glycerite contains ..
Hibiscus Liquid Extract, Organic Hibiscus Flower (Hibiscus Sabdariffa) Dried Flower Tincture Features and description: NON GMO! Gluten Free! Highest Strength Hibiscus liquid extract! Hibiscus liquid extract contains ONLY natural ingredients! High ..
Hispid Fig (Ficus Simplicissima) Glycerite, Organic Dried Roots Alcohol-Free Liquid Extract, Wu Zhi Mao Tao, Glycerite Herbal Supplement Features and description: NON GMO! Gluten Free! We made this Hispid Fig liquid extract using ONLY natural ing..
Hispid Fig (Ficus Simplicissima) Tincture, Organic Dried Roots Liquid Extract, Wu Zhi Mao Tao, Herbal Supplement Features and description: NON GMO! Gluten Free! We produced this extract using a cold maceration method of extraction to ensure that t..
Holy Basil Alcohol-FREE Liquid Extract, Organic Holy Basil (Ocimum tenuiflorum) Dried Leaf Glycerite Features and description: ALCOHOL FREE! NON GMO! GLUTEN FREE! Expertly extracted Holy Basil ALCOHOL-FREE liquid extract! Holy Basil Glycerite cont..
Holy Basil Liquid Extract, Organic Holy Basil (Ocimum tenuiflorum) Dried Leaf Tincture Features and description: NON GMO! Gluten Free! Highest Strength Holy Basil liquid extract! Holy Basil liquid extract contains ONLY natural ingredients! ..
Homalomena Liquid Extract, Dried rhizome (Homalomena Occulta) Alcohol-Free Glycerite Features and description: NON GMO! Gluten Free! We made this Homalomena liquid extract using ONLY natural ingredients! This extract does not contain Alcohol, GMO..
Homalomena Liquid Extract, Dried rhizome (Homalomena Occulta) Tincture Features and description: NON GMO! Gluten Free! We produced this extract using a cold maceration method of extraction to ensure that the broad spectrum of therapeutic plant com..
Hong Jing Tian Liquid Extract, Dried root (Rhodiola Rosea) Alcohol-Free Glycerite Features and description: NON GMO! Gluten Free! We made this Hong Jing Tian liquid extract using ONLY natural ingredients! This extract does not contain Alcohol, GM..
Hong Jing Tian Liquid Extract, Dried root (Rhodiola Rosea) Tincture Features and description: NON GMO! Gluten Free! We produced this extract using a cold maceration method of extraction to ensure that the broad spectrum of therapeutic plant compou..
Hoodia Alcohol-FREE Liquid Extract, Hoodia (Hoodia Gordonii) Dried Plant Powder Glycerite Features and description: ALCOHOL FREE! NON GMO! GLUTEN FREE! Expertly extracted Hoodia ALCOHOL-FREE liquid extract! Hoodia Glycerite contains ONLY natural i..
Hoodia Liquid Extract, Hoodia (Hoodia Gordonii) Dried Plant Powder Tincture Features and description: NON GMO! Gluten Free! Highest Strength Hoodia liquid extract! Hoodia liquid extract contains ONLY natural ingredients! High Quality Hoodia liquid..
Hops Alcohol-FREE Liquid Extract, Organic Hops (Humulus Lupulus) Dried Flower Glycerite Features and description: ALCOHOL FREE! NON GMO! GLUTEN FREE! Expertly extracted Hops ALCOHOL-FREE liquid extract! Hops Glycerite contains ONLY natural ingredi..
Hops Liquid Extract, Organic Hops (Humulus Lupulus) Dried Flower Tincture Features and description: NON GMO! Gluten Free! Highest Strength Hops liquid extract! Hops liquid extract contains ONLY natural ingredients! High Quality Hops liquid extract..
Horehound Alcohol-FREE Liquid Extract, Organic Horehound (Marrubium vulgare) Dried Herb Glycerite Features and description: ALCOHOL FREE! NON GMO! GLUTEN FREE! Expertly extractedHorehound ALCOHOL-FREE liquid extract! Horehound Glycerite contains..
Horehound Liquid Extract, Organic Horehound (Marrubium vulgare) Dried Herb Tincture Features and description: NON GMO! Gluten Free! Highest StrengthHorehound liquid extract! Horehound liquid extract contains ONLY natural ingredients! High Quality.. Horse Chestnut Alcohol-FREE Liquid Extract, Organic Horse Chestnut (Aesculus hippocastanum) Dried Nuts Glycerite Features and description: ALCOHOL FREE! NON GMO! GLUTEN FREE! Expertly extracted Horse Chestnut ALCOHOL-FREE liquid extract! Horse Che.. Horse Chestnut Liquid Extract, Organic Horse Chestnut (Aesculus hippocastanum) Dried Nuts Tincture Features and description: NON GMO! Gluten Free! Highest Strength Horse Chestnut liquid extract! Horse Chestnut liquid extract contains ONLY natural ..